The Zender Agenda: House Concert Announcement! I’m thrilled to be announcing my 8th house concert! My last show with Mike Edel in May was so good, I was actually nervous about hosting another one that could match that experience. As soon as I saw Oliver Hazard opening for Mt. Joy at the Beachland Ballroom, I knew these could be the guys. I chatted with them after the show and they seemed amenable, but they also have a lot of things coming up for them. Luckily, we were able to work this out! I have limited seating, so reservations are necessary! I couldn’t be more excited to be hosting these guys, and I hope you can come! "‘We got so much acclaim from people at the bar that it made us think maybe we were playing good music,’ says Belazis, who returned to California and stayed there for most of 2017. 'We have played one special show about every three months, but it worked out because we haven't burned out our fanbase and we have seen measurable growth.’"
"The three friends, who together make up the indie/folk band Oliver Hazard, announced in January they were put on the bill to play this summer’s annual Bonnaroo Music and Arts Festival, a three-day event that had more than 90 acts including Eminem, The Killers, Paramore, Bon Iver, and Khalid at a 700-acre Tennessee farm. 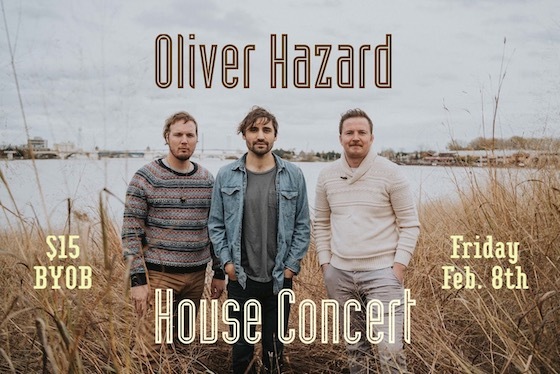 The gig was the biggest show Oliver Hazard has ever played. Yet, when the band walked on stage at 9:30 p.m., the trio had played no more than 20 shows as a band."